How To Download FIFA 16 Demo on PC ? Here is how you can download once its available on different systems. 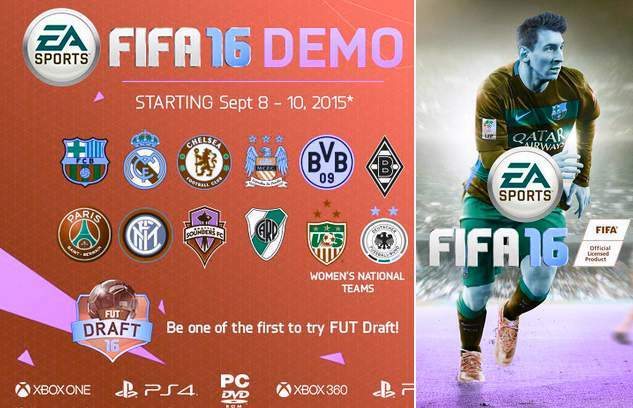 PS4 & PS3: EA will release the FIFA 16 demo through PSN store and will be available for free. XboxOne & Xbox360: FIFA 16 demo will be available on Xbox Marketplace for both XboxOne and 36o users, again it will be free to download. PC: The download link will be available on the official EA Sports website but we will also place the download link for PC users right here on 08th September 2015. Whats in the Demo ? Unlike the previous demo released in last several years, EA Sports has confirmed quite an extensive demo material which includes Spanish and German league official TV presentation, 8 top clubs and 2 women team. Teams in the demo: FC Barcelona, Real Madrid, Chelsea, Manchester City,Borussia Dortmund, Borussia Mönchengladbach, PSG, Inter Milan, River Plate, Seattle Sounders Plus *United States & Japan Women national teams. Match Conditions: You can play a kickoff match with 4 minutes halves with 3 difficulty levels including (Professional and World Class). Options in setting match conditions for example, Day/night – Autumn/Fall – Rainy/Clear. FUT Draft: Plus a brand new FUT draft mode where you can pick players of your choice and play and offline match. Women Match: Of course EA included two women national teams to give users a chance to play with women teams for the first time in history of football gaming. You can play a match between USA women team vs Japan women team. You can not pick women team vs men teams.